As if your Ancients weren’t powerful enough! 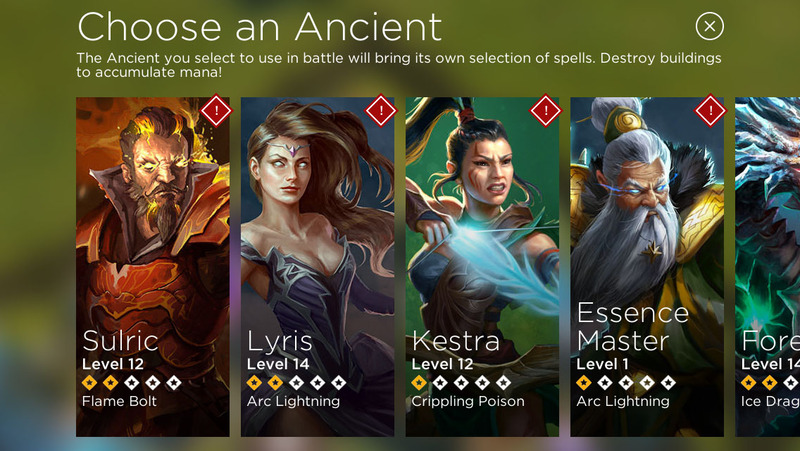 Here you can level up your Ancients to improve their abilities and starting Mana. 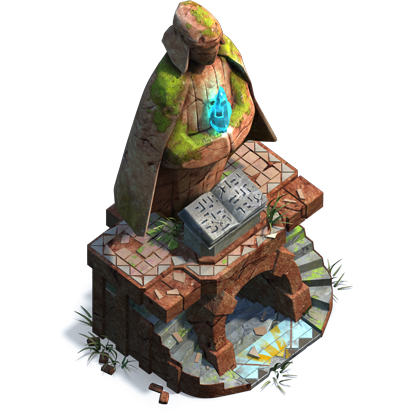 Upgrade your Ancient Shrine to allow for higher Ancient level enhancements. Upgrade all of your Ancients to their maximum level and test them in battle to master their skills. 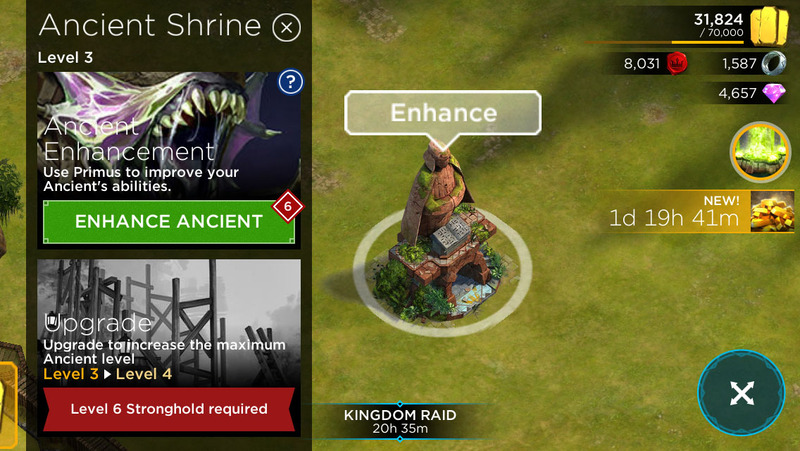 You can enhance your ancients by tapping on the Ancient Shrine from your village (also from the menu). Tapping on "Enhance Ancient" will bring up a list of all the ancients you've discovered. XP circle - a circular view of how much XP you require to get the ancient to the next skill level. The "?" will bring you to another screen which shows all the skills for each level. Primus Bar - you can drag & drop up to five Primus at a time to enhance your Ancient. Primus to XP is a 1:1 ratio. Do note that higher levels require higher XP (Primus) and gold to enhance to the next level. Available Primus - all the applicable Primus will be shown in the bottom right section. 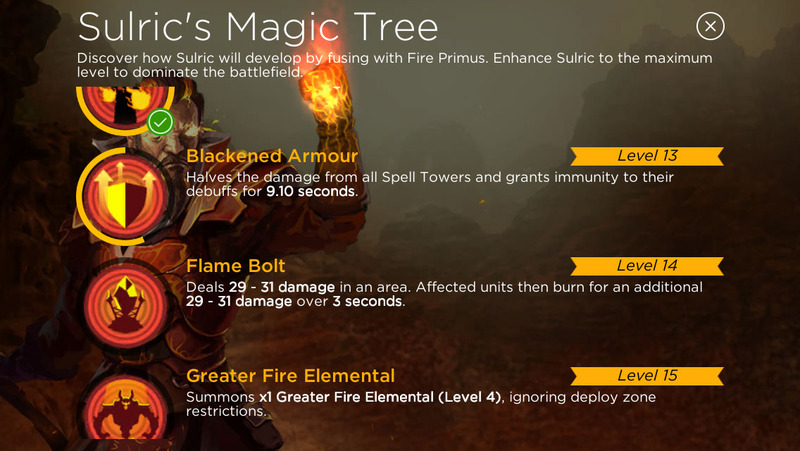 If you're ehancing a Fire ancient, all your Fire Primus will be displayed, as well as all of your Pure Primus, which can be used for any Ancient. 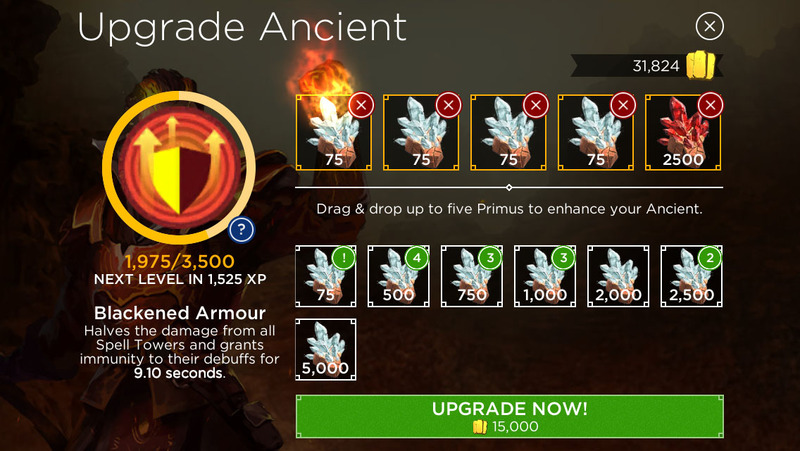 Tip: If your ancient is already maxed, you can get back to the Ancient Upgrade screen by using the Primus from your Inventory! Drag and Drop up to 5 Primus to the top slots to select them for enhancing, then tap "Upgrade Now!". 500 Primus = 500 XP, it's a 1:1 ratio. The cost to upgrade will be shown below. Note: Aegis costs Loyalty Points to enhance. 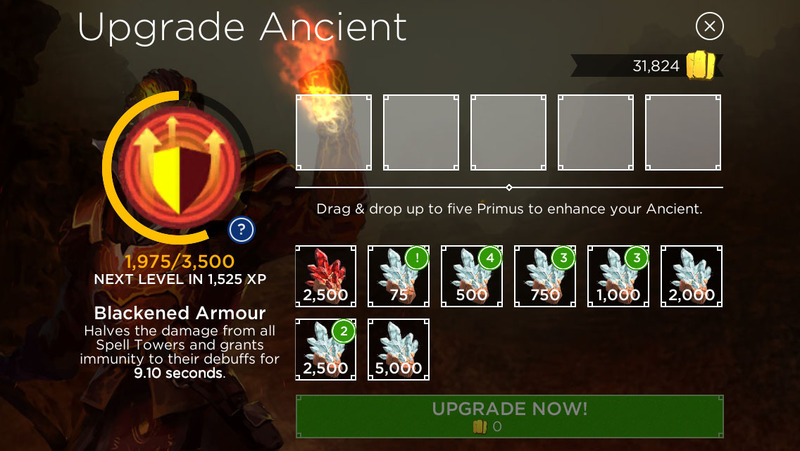 Tip: Higher ancient levels cost more Gold to enhance, you will save a lot of gold by using your smaller primus at the lower levels, and reserving your biggest primus bundles for the last levels. Clicking the "?" on the XP cricle will bring you to another screen which shows all the skills for each level. Different ancients cost a different amount of XP (Primus) per level. Elder Mages are the cheapest to enhance. Dragon Ancients cost twice as much as non-Dragon ancients. Click here for a page of enhance cost tables.